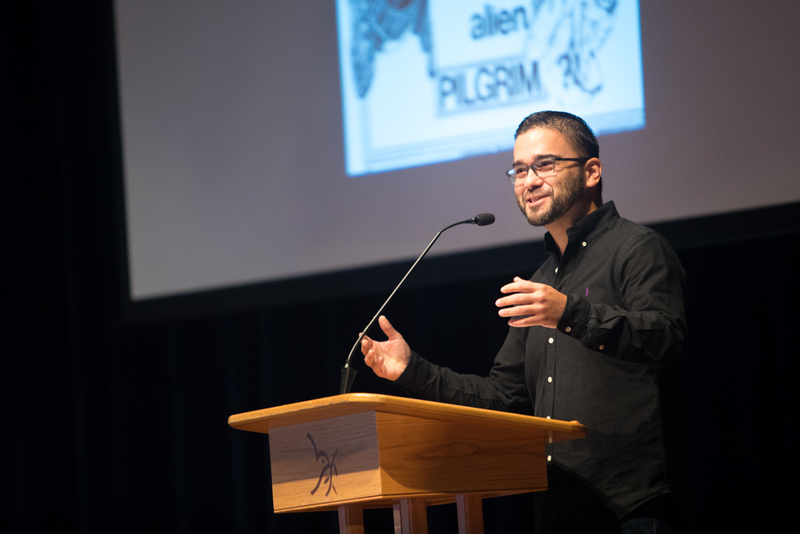 Professor Felipe Hinojosa offered a message of promise during his keynote address “Another University Is Possible” at Eastern Mennonite University’s annual fall faculty and staff conference: Embrace students as visionaries – and their activism as valuable learning opportunities – because they can be a source of transformation. A campus culture that “respects students’ right to protest” – that nurtures both students and the social movements they create, and embraces student activism as being the result of new knowledge at the core of liberation – benefits the entire community, said Hinojosa, a professor of history at Texas A & M. In their activism, students think critically, lead outside the classroom, practice civic engagement, and develop a greater sense of social responsibility. Hinojosa’s August 14 address on the conference theme of “Being or Becoming a Third Way University” began the two-day event’s broader discussions around campus engagement, civic collaboration and diversity and inclusion, goals that are articulated in the university’s strategic plan. EMU’s faculty-staff conferences bookend each academic year, with the fall event providing gathering in fellowship and renewal of the community’s common purpose and goals. 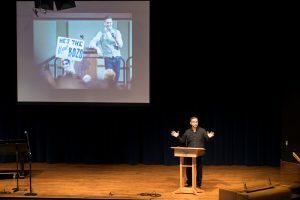 The event included workshop sessions, worship and fellowship opportunities, and what’s become an annual favorite, “Storytelling,” featuring members of the campus community sharing about their journeys to, towards or within the EMU community. Fall storytellers included professors Johonna Turner and Esther Tian; Jasmine Hardesty, director of development and planned giving; and Scott Barge, vice president of institutional effectiveness. The event was also a forum for announcements about the upcoming academic year, including the observance of MLK Day with extensive service and learning opportunities replacing scheduled classes. Hinojosa knows what it means to envision a different university. While a student at Fresno Pacific University in California, he joined student movements to encourage the hiring of more diverse faculty and expansion of the curriculum and academic programs. “How could a university in the heart of the San Joaquin Valley, surrounded by a large Latinx population and located in an area that gave birth to the greatest and most successful farm workers civil rights movement, not teach a course on this?” he said. The synergy between his own student activism and intellectual engagement – the “growth of political consciousness and understanding of history,” his own and his people’s – was both personally empowering and beneficial to the campus community. Now a tenured professor of history at Texas A&M University, Hinojosa also directs the history department’s undergraduate studies and is co-founder and co-director of the Latina/o Studies Working Group sponsored by the Melbern G. Glasscock Center for Humanities Research. Sharing his pedagogical philosophy that asks “So what? Now what?” with his students in courses about social movements, Latinx history, gender, comparative race and ethnicity, Hinojosa has become a resource, guide and mentor to diverse student activists. This role – and the work of activism itself – is “messy” and “chaotic,” but “more important than ever,” he said. In considering the role of the “third way university,” Hinojosa noted the history of socially progressive Christians. While “distorted forms of Christianity got the most play,” they quietly went to work in communities around the world. “A third way university must build on this radical tradition,” he said. In response to a question from Director of Multicultural Services Celeste Thomas, Hinojosa elaborated on additional ways of supporting black and brown students in the predominantly white university setting: listening to the voices and perspectives of marginalized students, hiring diverse and/or culturally competent faculty and staff, providing safe community spaces for these students, and prioritizing issues and the history of diverse communities in curriculum and academic programs. Afternoon breakout sessions offered faculty and staff opportunities to learn more about distinctive programs that link to core values of EMU’s mission and vision. Various restorative justice initiatives and programs were highlighted in a special session hosted by professors Johonna Turner and Carl Stauffer, who co-direct the Zehr Institute for Restorative Justice housed in the Center for Justice and Peacebuilding. Jon Swartz, associate dean of students, talked about restorative justice as it relates to the campus community and highlighted the growth, and growing interest, in RJ-related trainings. Meg Sanders, director of EMU’s Graduate Teacher Education program, spoke about the new master’s degree and graduate certificate in restorative justice, as well as the integration of RJ principles and practices into professional training courses offered by the university. 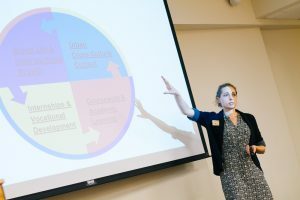 Director Kimberly Schmidt presented on the Washington Community Scholars’ Center, EMU’s Washington D.C.-based program offering cross-cultural urban studies, internship and community living experience. She was joined by Associate Director Ryan Good and Program Assistant Karlyn Gehring. Doug Graber Neufeld presented on the Center for Sustainable Climate Solutions, a collaborative initiative of Eastern Mennonite University, Goshen College and Mennonite Central Committee to lead Anabaptist efforts to respond to the challenges of climate change. Neufeld, a biology professor at EMU, directs the center.